Brianna Turner missed Notre Dame's national championship win last season with a torn ACL. With 49 seconds left in Friday's Final Four meeting with No. 2 UConn in Tampa, Florida, on Friday night, Turner had maybe the biggest block of her career, as she swatted Napheesa Collier's layup attempt to notch her 371st career-block and pass Ruth Riley to become the program's all-time block leader. Another big rebound and a few clutch free throws later and Turner and No. 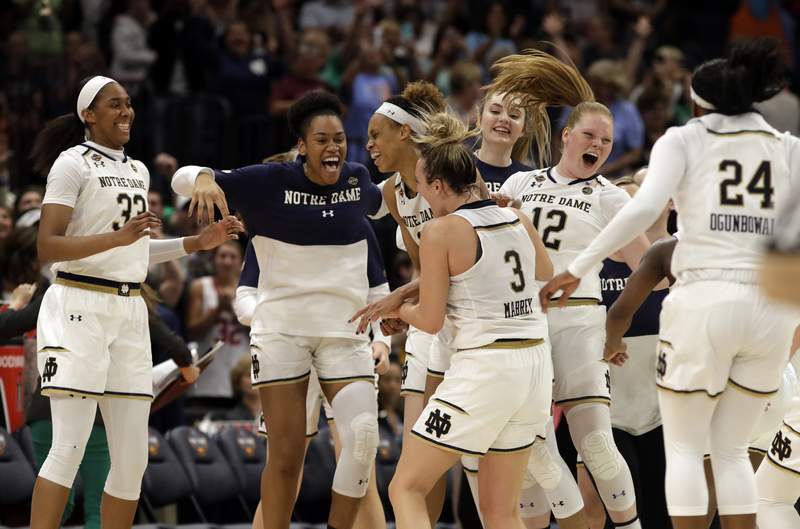 1 Notre Dame defeated UConn 81-76 in the NCAA semifinal for a second consecutive year, earning a date with No. 1 overall seeded Baylor in the national championship at 6 p.m. Sunday. UConn (35-3) held a nine-point lead at 64-55 with just under eight minutes to play. Back-to-back Arike Ogunbowale and Marina Mabrey 3s gave the Irish (35-3) the boost they needed to finish the game on a 26-12 run. But the senior forward was the difference maker again. After Ogunbowale and the Irish opened up their second consecutive game in dismal fashion, shooting 2 of 13 to start the game and finishing with just 12 points in the first quarter, that slump didn't last long. With just two points in the first half, Ogunbowale notched 21 points in the second to lead the Irish with 23 points on the night. Jessica Shepard, who played the most complete game for the Irish, added 20 points and 13 rebounds. Shepard and Turner dominated the boards, helping Notre Dame to a 53-37 rebounding advantage. UConn's Katie Lou Samuelson, who like Ogunbowale got off to a slow start, popped off for 20 second half points after being held scoreless in the first half. Christyn Williams added 19 points for the Huskies, including a pretty, mid-rang jumper at the half time buzzer, which put UConn up 30-29 at the half. The wild game featured 21 ties and 38 lead changes. Baylor defeated Oregon 72-67 to reach the national championship game.